Stuff4Sam is about our 5 year old friend Sam who was paralysed in a car accident in 2005. We have been raising money to buy him special equipment to stimulate and help him develop. 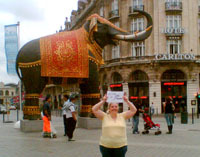 This is me in Lille, France last weekend. I am standing by an eight metre high fibreglass sculpture of an elephant that’s been put in front of the opera house to advertise an Indian exhibition. Looks as though this lad eats more chocolate than me! Hi Sam from the country! I went to a ploughing competition on Saturday. People used a tractor with a digger called a plough to make long, thin holes in the ground. These holes are called furrows. Seeds are planted in the furrows and grow into corn, which is used for making bread. 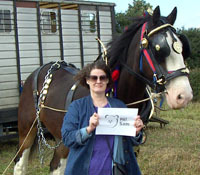 A long time ago, horses were used to pull the plough – like Robbie in the picture. There was a competition was to see who could make the straightest furrow! My friend Valerie had two goes. The first one was quite good but the second one was a bit wobbly! As the nights draw in we thought we’d try our hand at writing haiku (haiki?? ), a form of short Japanese poetry. The rules are quite complicated so we won’t go into them here (visit the wiki explanation if you want to know more) but it seemed a fitting thing to add to the site as Sam’s mum is Japanese. iced screen, wipers frozen wide. Sale update from Peterborough – books, cakes and scarves! Now in its fourth week, the Peterborough office book sale is a runaway success. So far an impressive £145 has been raised! Thanks to everyone who has donated and bought books so far. On October 27th there will be a cake stall in the restaurant. 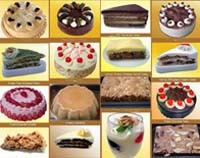 We need donations of your cake specialities to sell. It can be a cake you have made, biscuits, cookies, or even a donation of a Mr Kipling selection if you are not a brilliant baker. Contributions of homemade preserves or other delicious delicacies would also be very welcome. Our on-site catering company are donating a fabulous cake which will be raffled. As the 27th is a Friday we are sure that the Peterborough teams won’t miss this opportunity to treat themselves for the weekend! Finally there will be a handmade knitted scarf sale (various colours and prices) in the restaurant on November 15th. If we sell out and you still want that special gift for Christmas or even to treat yourself then don’t despair as orders can be taken. Our team of trusty knitters are standing by! We’ll keep you posted on progress. Hi Sam from Comino, Malta! This was taken in the Blue Lagoon in Comino, right next door to Gozo in Malta. According to legend, this was Homer’s isle of Ogygia, where the nymph Calypso (bit of a saucy lady) held the Greek hero Odysseus captive for seven years (poor chap, must have been very difficult for him). We only got to spend an afternoon there (presumably Calypso’s afternoon off) but will hopefully head back there soon. Do you have a talent for making things? Are you demon knitter or a crafty carpenter? If so, we need your help. The office Christmas crafts sales (in London and Peterborough) are soon to be confirmed for November / December and we need your help. 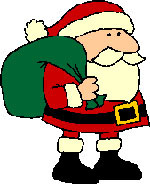 We are looking for donations of quality items that people would buy to give as Christmas presents. We need a good spead of stocking filler and more substantial items. If you want to talk through your ideas email stuff4sam@gmail.com or post comments here. If you don’t have creative juices, then come along to the sale, buy your Christmas gifts and then pass them off as your own creations! Easy! If you are not part of RNIB why not send us your items or set up your own sale? Please support us help raise money to get stuff4sam. Many thanks to Jenny Esse! Many thanks to Jenny Esse L.R.P.S (that’s the kind of funny name you get when you start doing stuff with cameras apparantly) who has donated a batch of cards she made out of photos taken in Vietnam, Venice and Tuscany. We’re selling these along with the books4sam which so far has raised over £500! 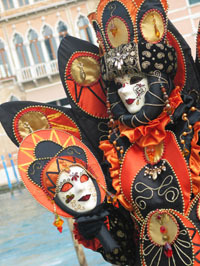 The shot above of the masked man was taken at the Carnival in Venice. 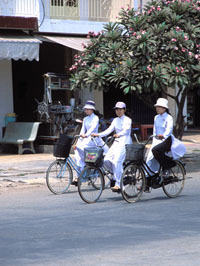 The other image was taken in Hanoi, Vietnam and is of three girls in traditional Vietnnamese dresses called Ao Dai’s riding their bikes. Here I am on holiday from New York City on the beaches of Normandy, France. That’s me in the hat and I am standing with my friends Morgan, Lauren and Gail from Los Angeles, California, their friend who is kneeling on the sand, Ariel from Paris, France, my son Christopher who lives in Malta and unseen (taking the picture) is Henny from London, England. We gathered here from all over the world to wave hello to you. That is the English Channel in the background and when we took this picture in July it was so hot that my son actually went swimming. There is nothing like beautiful water, sand between your toes, the sun on your face and being with good friends to make you believe that all can be right with the world. We’ve all read, with absolute thanks, your message of genuine care and kindness to us all. I can say I am flabbergasted. You have come to our need and kept on giving your kindness over the past year. I can never repay you and you will never fully know how desperate we are and how much your kindness has meant to us. Things don’t get any better at all, but your kindness always being there makes us feel that we have friends fighting for Sam and friends we can fall back on. Sam is quadraplagic and can’t breathe as a result of the car accident. He was a normal healthy active boy before but because of someones’ careless driving, he is now as he is. We are so very proud of how he has survived, who he now is and how he continues to smile and be so damn strong in spite of everything. He is simply amazing. The hot weather has made things difficult for Sam as his injury doesn’t allow him to regulate his temperature. This combined with extra secretions and the equipment failing to humidfy him properly exasperated his condition over the summer. It meant that we were effectively housebound for weeks on end and Sam bed bound. However, we have some good news. Ever since the injury last year we have been trying to get Sam assessed to use a Funtional Electrical Stimulation (FES) bicycle called the RT300-S. It was pioneered in America with Christopher Reeve and his physician Dr McDonald and basically stimulates Sam’s legs with electric currents to rotate the cycle legs and provide Sam with the only ‘exercise’ he will be able to get. It actually makes quadraplagics out of breath and have cardiovasclar exercise. Even though they are not driving the machine, their body responds as if it does. Basically no child in the UK does this and in America there are only a handful, the youngest being 4 1/2. We had planned to go to America to get Sam to do this at Shriners Hospital (the only place in the world that does this for children), but have manged to get a UK hospital involved and supporting it’s use. There are hundreds of issues and the most important is to make sure it doesn’t do any harm, but it’s a huge effort to get this supported as so many people wouldn’t even listen. Just two weeks ago we visited the hospital again and for the first time in a year we saw Sam’s little legs move the way they should. His muscles contracted in sequence and drove the cycle around and he looked pleased! Dr McDonald now knows about Sam and will meet Sam when he in the UK to offer guidance. As Sam will be the youngest child in the world to use this new therapy he will follow Sam closely to see the result. There is always a possibility, and it is not yet proven or really spoken about, that this form of exercise could hold the possiblity to stimulate nerve regeration. Christopher Reeve put his functional recovery down to it. Our aim is to get Sam healthy again. We haven’t yet got the machine, but it’s on order. I wanted to finnish by saying, that if it wasn’t for you, we would never be able to get it. We would not have enough money ourselves and due to the complexities of compensation it would not pay for this. We would be left knowing that it is essential for Sam but that it was impossible to get this amazing new therapy. Thanks to you all and fundraising done by my cousin we have almost the right amout to get it – £14,000. If only you could understand how much this means to us – it is absolutely everything. Please send our thanks to everyone. We will never be able to repay them – it’s simply too big for words and I am at a loss to thank you enough. With all our thanks and best wishes. I’ve been muttering for some time now that I’m going to bike to work for a week and put the money into Sam’s fund and I’ve finally run out of excuses for putting it off…the heatwave has long gone, no more monsoon like rain and not a hint of snow in sight. Next steps are to find my A to Z, free the bike from the hedge in the back garden and have a few practice runs around Peckham.